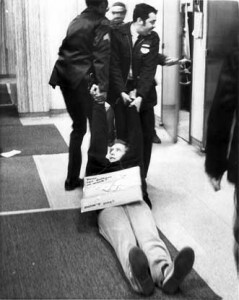 Ed, while under arrest, being dragged out of the Manhattan IRS office on tax day in 1981. 1969 Refused induction into the Army during the Vietnam War.1970 While a graduate student in astronomy at the University of Texas, Ed began resisting the war tax on telephone service. Helped form Direct Action, the WRL affiliate in Austin, Texas. 1972 Started resisting and rerouting all his federal income taxes and continues to do so up to the present by filing his returns, including a letter of explanation, and sending the resisted taxes elsewhere. 1973 Joined the national staff of the WRL in NYC (where he remained until 1986) as a locals’ organizer, and dealing with program areas on disarmament, counter-recruiting, draft registration resistance, war tax resistance, nuclear weapons and power. 1977 For a WRL brochure on war tax resistance, Ed developed the WRL’s first pie chart analysis of the government’s military spending. In 1984 this evolved into the first WRL pie chart leaflet, which has been updated and published annually by WRL ever since. 1981 Wrote and edited the first edition of War Tax Resistance , published by the War Resisters League and is now in its fifth edition. 1982 Helped organize the national conference in Washington, D.C., which led to the formation of the National War Tax Resistance Coordinating Committee. 1998 The U.S. Justice Dept. served him with an “Order to Show Cause.” This resulted in a 1999 appearance Federal District Court (in Brooklyn) to explain before a judge why he should not be held in contempt for refusing to turn over the sources of his assets to the IRS. Among other reasons, Ed explained that he did not want to answer because that might assist government efforts to prosecute him (i.e., the Fifth Amendment defense). The judge accepted this explanation and there have been no further attempts to prosecute. 2007 The IRS begins a new intensive effort to collect by assigning an ATAT (“Abusive Tax Avoidance Transaction”) agent to the case, following Ed’s appearance on “The Neil Cavuto Show” on Fox TV. Over the years, he has helped organize numerous “tax day” demonstrations at the IRS, including one at the Manhattan IRS in 1981 that — after two court cases — established the right to leaflet and table inside the public areas of the IRS. Ed has been covered in several newspaper articles, appeared on many radio talk shows and on live national television interview shows (“The Phil Donahue Show” in 1982, “CBS This Morning” in 1995, “The Neil Cavuto Show” in 2007, “GRITtv with Laura Flanders” in 2009). What is war tax resistance, reasons for refusing, how to resist, and consequences. Why isn’t everyone in the peace movement a war tax resister?